Washroom odours have been a problem since mankind first realised the smell of our own waste was not a pleasant one. For years there have been extra fragrances we could add to try and mask the bad smells, however, never remove them. Well that has all changed now with the introduction of the Sterillo, a hand dryer that really does remove odours from bathrooms? 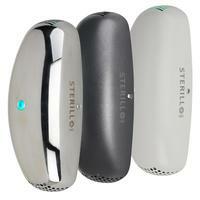 The Sterillo is a hand dryer like no other. Its patented technology destroys airborne germs and bacteria, eliminating unpleasant bathroom smells – for good. Raymond Martin, MD of the British Toilet Association and campaigner for better public toilets for all. When it’s not drying hands, heated plates tucked away inside the Sterillo silently and continuously draw in bathroom air. 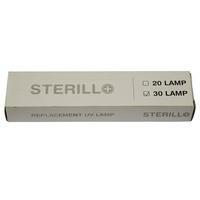 Once inside, the Sterillo bombards the air with the same germicidal UVC light that’s often used to disinfect hospitals and care homes. The germicidal light destroys the smell-causing germs and bacteria in bathroom air. Air fresheners might mask smells. The Sterillo removes them – and it does so really quite efficiently. In independent government tests, the Sterillo removed 99.96% of the common contaminate Staphylococcus Epidermidis from the air. Odours aside, how well does the Sterillo dry hands? How does it perform on a basic hand dryer hygiene level? Well, the Sterillo has the power to move air particles 110 metres in a single second. With a maximum airflow of 245 miles per hour, the Sterillo is well and truly a high speed hand dryer. In tests, the machine dries hands completely in as little as 8 seconds. You’d be surprised at what’s really lurking in bathroom air. The smells you find in public toilets? They’re largely airborne feacal particles. Every new toilet flush shoots an invisible mushroom cloud of bacteria into the air – and without an effective toilet odour removal system, the odours linger. 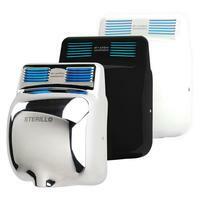 The Sterillo is the only hand dryer that is also a toilet odour eliminator. 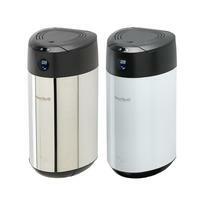 It literally removes bacteria and germs from the air. When it’s not drying hands, the Sterillo silently and continuously draws in bathroom air, before blasting it with germicidal UVC light. The light destroys both germs and the unpleasant odours the germs cause – boosting hygiene and improving washroom sanitation. The bacteria and germs lurking in bathroom air don’t stay airborne forever. Eventually, they settle on bathroom surfaces – such as taps and door handles. By proactively treating bathroom air round-the-clock, the Sterillo eliminates germs before they settle. Providing round-the-clock washroom sterilisation, the Sterillo keeps surfaces clean, as well as the air. 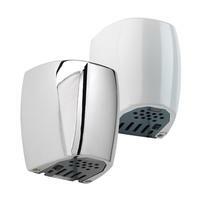 As the only hand dryer that removes germs and smells from bathroom air, the Sterillo sets businesses apart. A free splashback draws attention to the fact the Sterillo cleans air and kills smells. And when you consider 78% of the British public associate unpleasant odours with an unclean bathroom, it’s easy to see how the Sterillo could be good for business. When it’s not drying hands, the Sterillo works round-the-clock to remove germs and smells from bathroom air. And yet it remains economical and energy efficient. Its smart technology senses ambient air temperature and adjusts an internal heating element accordingly. The Sterillo heats surrounding air to 40°C only, no further. An impressive technological spec ensures it uses less energy, is kind to the planet and keeps running costs at around £10-£20 per year. Hand dryer hygiene is a hot topic these days, which is why most of our Odour Control hand dryers have been developed specifically to help you strengthen your washroom’s resistance to germs, smells, waterborne and airborne bacteria. Hand dryers and bacteria – do hand dryers spread germs? Due to the ongoing war being waged by the paper towel industry, hand dryers and germs have somehow become a source of great debate. Having received much undeserved negative press lately, it’s important to be aware of the underlying benefits of hand dryers to both washroom hygiene and cost-efficiency. A washroom atmosphere can indeed become less than sanitary, but hand dryers fitted with a HEPA filter effectively cleanse the air before blasting it onto a user’s hands. So, provided that you inspect or replace your dryer’s internal HEPA filter every 12 months, it will provide a consistently pleasant and hygienic stream of air. Keeping hand dryers sanitary includes regular cleaning of the dryer casing, inside and around the unit. Both hand dryers and paper towels are capable of spreading a limited number of germs, but this is nothing compared to the huge transfer of bacteria and other harmful particles on hands that are not dried at all. Wet hands provide the perfect environment for bacteria to breed and multiply, and according to a paper by the Mayo Foundation for Medical Education and Research, “the proper drying of hands after washing should be an integral part of the hand hygiene process”. Since high speed hand dryers are capable of blasting moisture away from the skin, they are an incredibly effective way to fight the spread of coughs, colds and bacterial diseases. If bathroom odour is harming your company’s reputation, you’re not alone. Luckily, we’ve used our expertise in hand dryer hygiene and odour-combating technology to develop the perfect solution. As the only hand dryer that removes germs and smells from bathroom air, the Sterillo dryer sets businesses apart. When you consider 78% of the British public associate unpleasant odours with an unclean bathroom, it’s easy to see how the Sterillo could be good for business.